The Strawberry Donuts are Coming! The Strawberry Donuts are Coming! Listen, my children, if you can, and hear of the wonders of Donut Man! The official announcement has been made. One of SoCal’s greatest culinary creations, the pride of the foothills, Donut Man’s strawberry donuts, will be back in Glendora January 25, 2019. That gives you three whole days to prepare. Pack up a sun hat, suntan lotion and a folding chair and prepare to wait in line. The good news is that The Donut Man is open 24 hours a day, and now accepts credit and debit cards! Jim Nakano, The Donut Man, along with his wife and business partner, Miyoko, has been slinging his special fruit-filled delicacies for over 45 years along the Western edge of Route 66. Elvis was one early fan, and Jim has been interviewed by the likes of Huell Howser and Alton Brown. 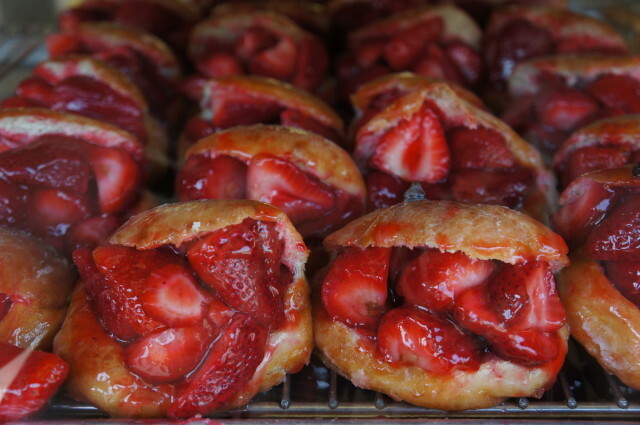 The legendary donuts are kind of a cross between a glazed donut and a strawberry pie. A delicate, sweet donut (like those used for jelly donuts) is halved and stuffed to bursting with fresh ripe strawberries and a sweet glaze. The demand for these donuts is so great that for the first two weeks of donut season, The Donut Man makes only the strawberry donuts. No word yet on the peach donuts. Stay tuned as the story develops.